Warlord Games – 2nd Edition Bolt Action CORE RulebookThe second edition of the simple, yet enjoyable, Bolt Action World War II wargaming rules.With more than 23,000 copies sold of the first edition, this second edition of the best-selling Bolt Action World War II wargaming ruleset from Osprey and Warlord Games presents streamlined and refined rules, incorporating all the FAQs and errata compiled over four years of intensive gameplay. It is fully compatible with the existing range of supplements and also introduces new material. 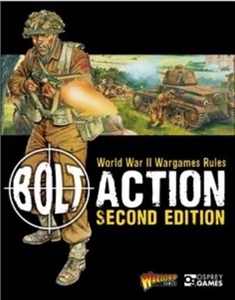 Written by veteran game designers Alessio Cavatore and Rick Priestley, Bolt Action provides all the rules needed to bring the great battles of World War II to your tabletop. Using miniature soldiers, tanks and terrain, you can fight battles in the shattered towns of occupied France, the barren deserts of North Africa, and even the sweltering jungles of the Pacific. Army options are almost limitless, allowing you to build the kind of army that most appeals to your style of play, from heavily armoured tank forces to lightly armed, but highly skilled infantry. The choice is yours.